The Children's Bed Centres Winter Sale is Here! Our big winter sale is now on save up to 30% off all furniture items. Who doesn't love a good sale? Treat your little prince or princess to a new bed this winter. In fact, why not revamp the whole bedroom! All furniture is now on sale for a limited time only. Not only can you grab your self a beautiful bargain, we also provide free assembly on all orders by our fantastic delivery team. There's no need to worry about flat pack, missing screws or faulty beds with us! Our team are specially trained and have been in the industry long enough to know the difference between a head board and a foot board! Free assembly is included in the price, meaning you all you have to do is buy the item and wait patiently for your bed to be carefully manufactured by our craftsmen. Orders typically take 4-6 weeks to be manufactured and delivered, they best things come to those who wait, right?! Most of our beds are available with under bed storage, including our cabin beds, captains beds and our storage beds. All beds have either 2 or 3 deep set draws, ideal for storing clothes and other items. If your little one is stuck for space in their bedroom, you will find all you need at Childrens Bed Centres. Our wardrobes are available as a single combi wardrobe or as a double combi wardrobe meaning that no matter the space you will have somewhere to store your clothes. Our double combi wardrobes are available with pigeon hole shelving and a hanging rail, or just a full width hanging rail, whatever your preference! On sale now we also have our fantastic chest of drawers, these drawers are available in a range of styles to match other furniture items. Also on sale now is our furniture collections, a modern take on our original style of furniture our four new furniture collections are ideal for adding a splash of colour in to your little ones bedroom. We understand that furniture can be tight in smaller bedrooms, especially when you need a bed for a box room or a bed for an attic room. Our beds are available in two widths and three lengths to enable you to accommodate for those smaller spaces. So long as our delivery team has an extra 10cm to work with, we will assemble your furniture free of charge! Included in our sale is our toddler beds, which are an ideal step up from a toddler bed. We also have on sale our cabin beds and captains beds which work perfectly for older children. 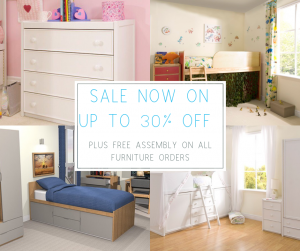 There is up to 30% off our new collections, these new collections are ideal for older children and teenagers as they provide provide ample storage as well as providing a modern and simplistic look.